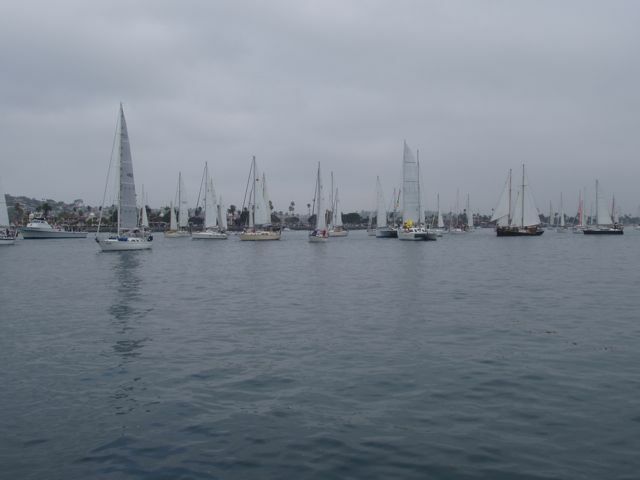 The Start of the 2011 Baja-Haha! 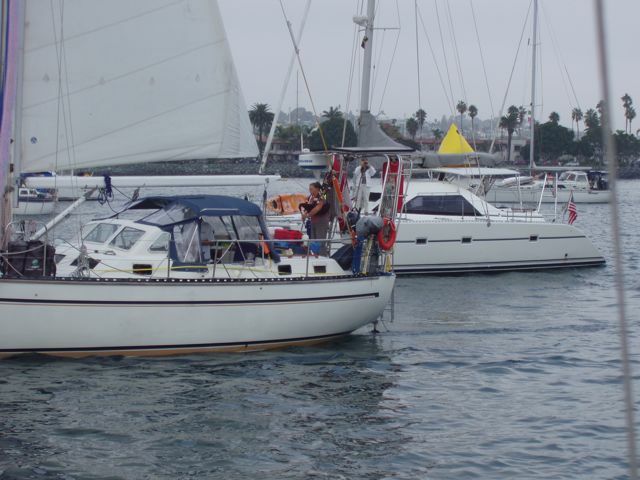 We've come down to the actual start of this mythical event and we're beginning our trip from San Diego to Cabo San Lucas, MX. It's almot too much to accept. 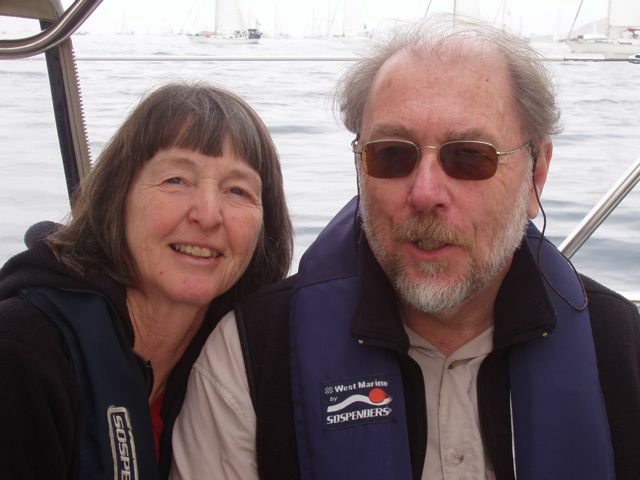 Our crew is aboard (Jerry and Nancy Wertzbaugher), the boat is running well, and we're provisioned with food, fuel, booze, and water. The next 10-12 days will see us enter Mexican waters and travel toward the tip of Baja California. 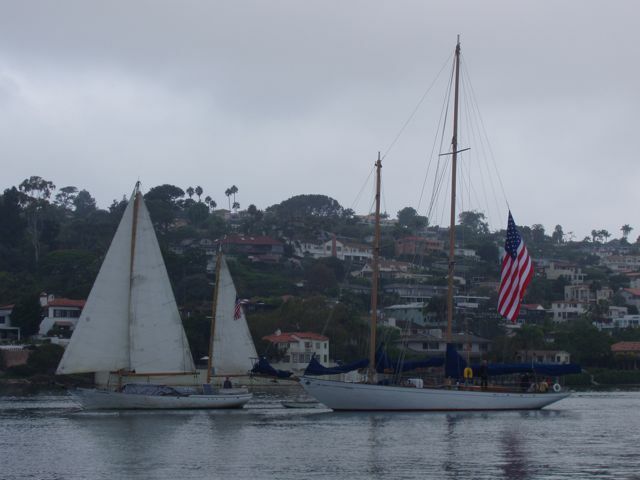 The overcast weather could not dampen our enthusiasm for the start. 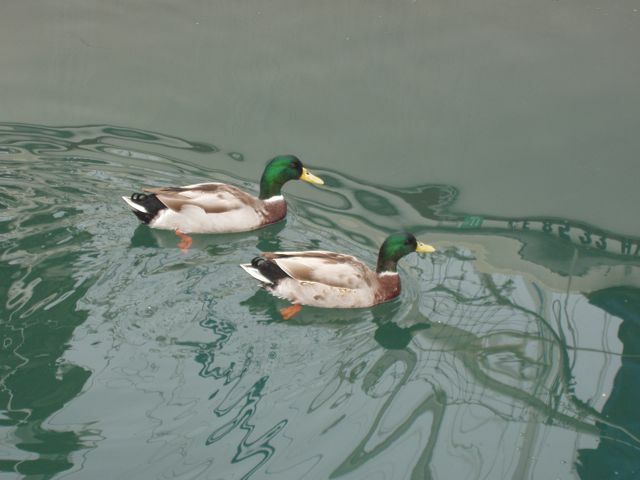 This pair of Mallards (at least I think that's what they are) went from boat to boat begging for handouts. 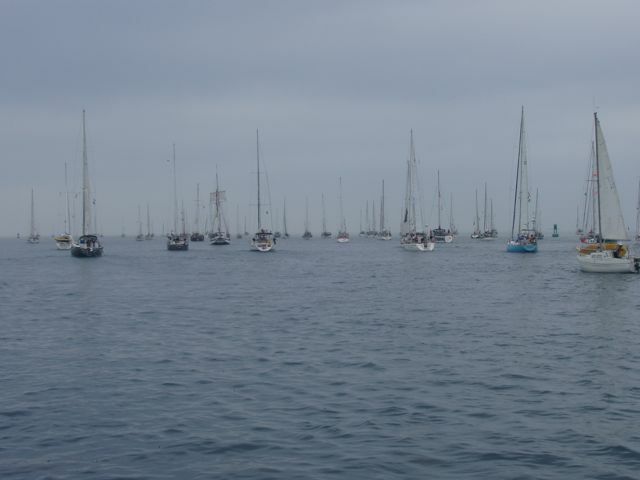 These beautiful boats are headed to the start. 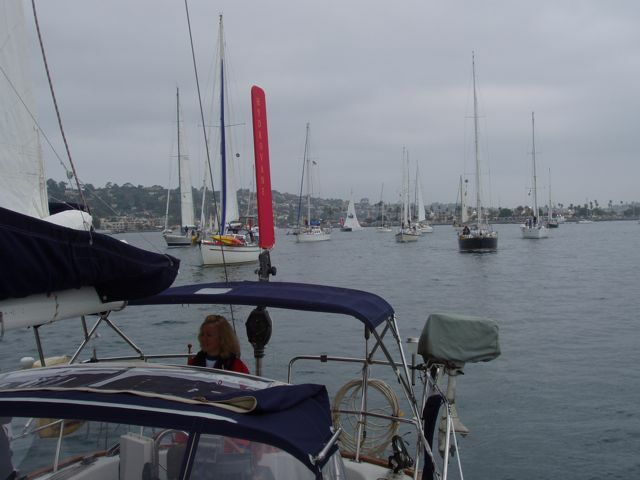 A tiny segment of the fleet prepares for the start. 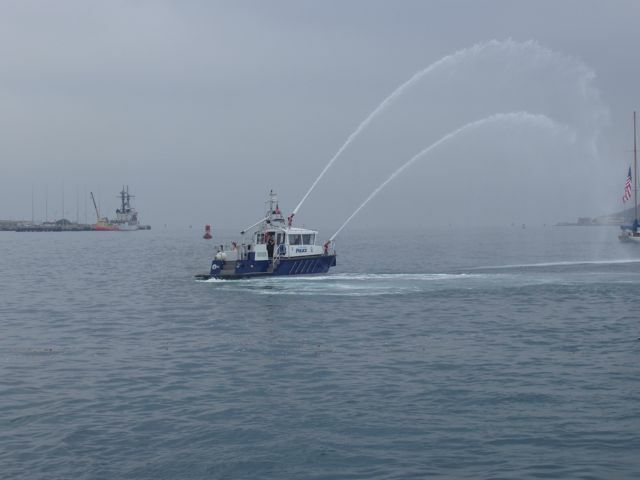 The start was annonced by firing the official America's Cup cannon. How cool is that? 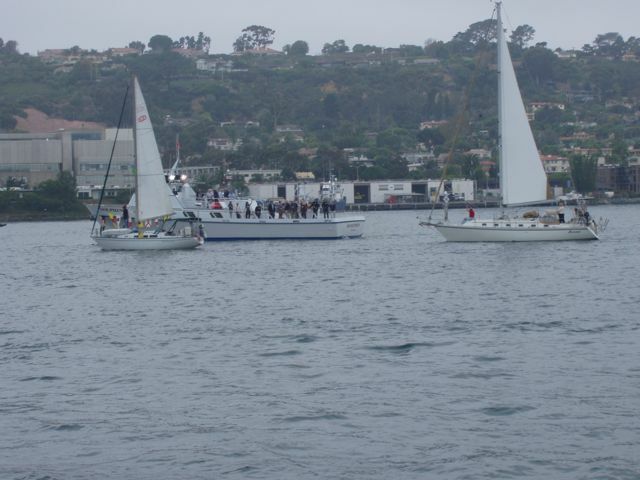 Boats head for Mexico as the gun is fired. Patricia Bell heads south. They are a young crew of enthusiastic sailors. The San Diego police help us celebrate the start. Thanks, folks. The power boat in the middle is the "media boat" and carries all the local radio and television crews. I guess it's part of our 15-minutes of fame. Serenaded by a bagpipe! This lady played, nonstop, for about 30 minutes, providing a fine musical sendoff. With Conni and the helm, it's our turn to pass the starting line. 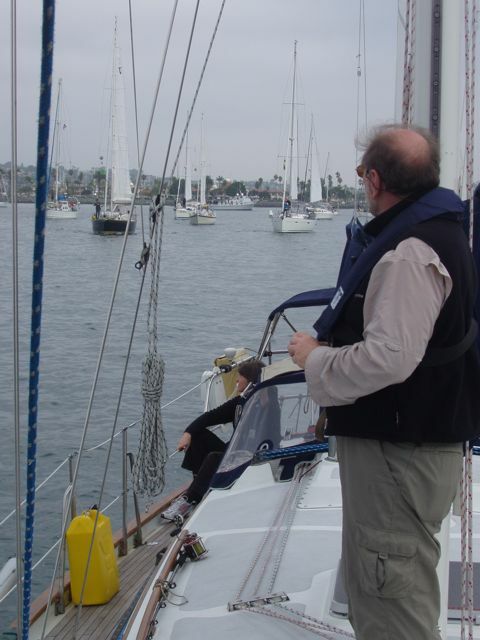 Jerry looks astern to study the fleet. A junk-rigged sailboat, the first I've ever seen. 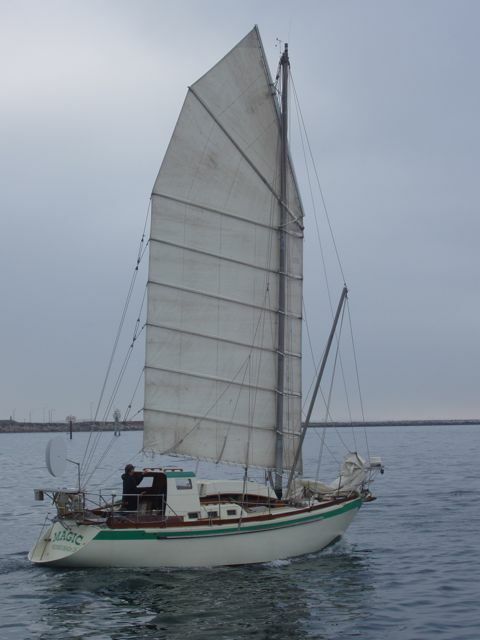 They've had to modify their rig significantly to fly the thing (note outriggers to starboard of the mast) and it did not, as we learned, sail fast. The Chinese junk has sailed for thousands of years and was "rediscoverd" a few years ago. This skipper took the jump to the junk. 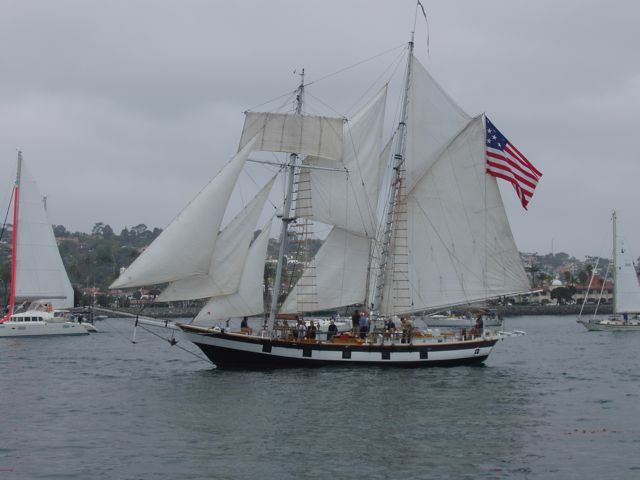 Note that the sail is now on the port side of the mast, and to tack, the entire sail has to be moved to the startboard side, necessitating the modified rig. 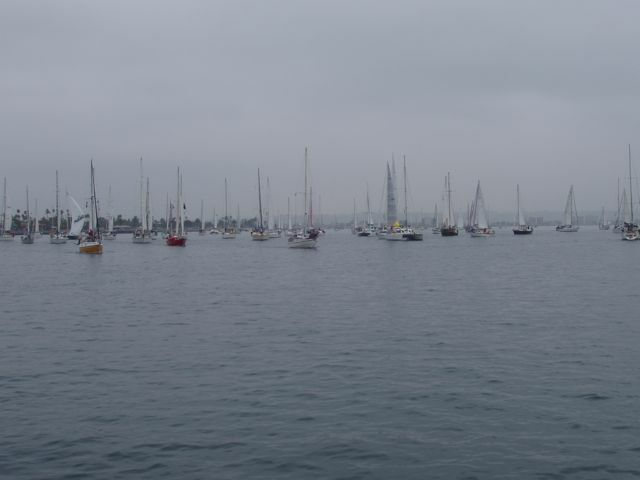 160 sailboats head for Mexico. Jerry and Nancy Wertzbaugher, our crew. 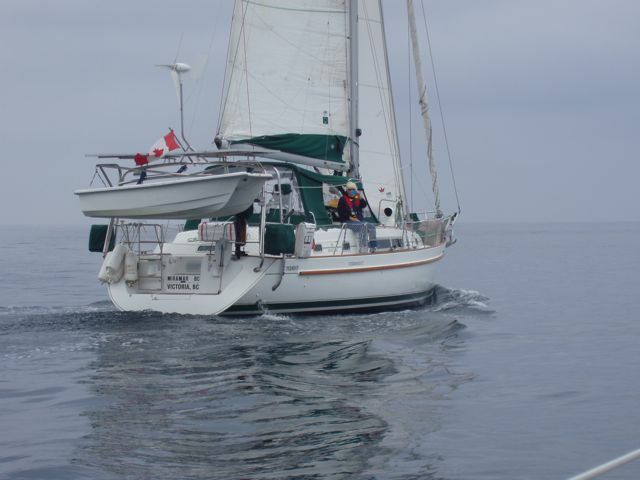 They had owned and sailed a Hylas 49 for many years and we had joined them in the Caribbean for a week's sail. They are experienced blue-water sailors who are helpful, relaxed, and easy to get along with. With them on watch, sleeping was easy. Our Vicoria, BC Canadian friends on Miramar wave hello.